Ria's Collection: BEEF IN RED WINE & DOUBLE GARLIC FOUGASSE...for 100,000 hits! 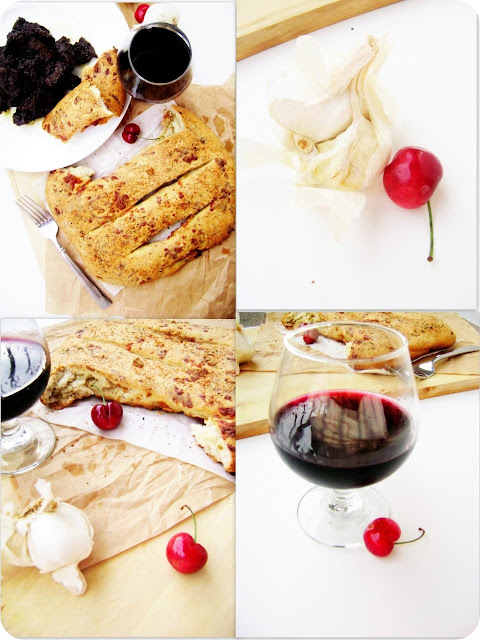 BEEF IN RED WINE & DOUBLE GARLIC FOUGASSE...for 100,000 hits! I am proud of my blog :) Jobin & I were counting the visitors every day till a few hours ago when it actually hit 100,000. He took me out for dinner last night as a part of our li'l celebration :) I must say, that was some real good Chinese food I have had in US. Wash and clean the meat and marinate it with soya sauce, pepper and salt for 3 hours or overnight in the refrigerator. Next day,pressure cook the meat till done. Do not discard the stock. Heat oil in heavy bottomed pan and add the onions and saute till soft and translucent. Add in the crushed garlic and saute for 2-3 minutes. Add in the cooked beef and mix well. Let it cook for 5 mins. Check for salt. Add in some soya sauce if you want some more. Reduce the flame to low, add in the wine and cook for 20-30 mins. Hand whisk water & yeast and let stand 2-3 minutes.Briskly whisk in sugar ,salt ,oil and most of the flour.Knead on lowest speed for 5-8 minutes and form a soft dough. Oil the dough, cover and let rise for 45-50 minutes. ( *If you are using the regular yeast and not rapid rise, increase your rising time to1 1/2 hours). Meanwhile assemble the filling ingredients.Divide it into 3 portions. Turn out dough onto a lightly floured surface and gently deflate.Pat out a 12" round . Smear dough with salt,pepper, Italian seasoning,minced garlic,garlic powder,2-4 tsp of garlic oil and cheese. Roll up and rest for 5 minutes. Then roll out into a 10" and repeat seasoning. Let rest for 10-15 minutes and roll out tnto 12-15" round or oval. Place on a parchment paper, smear seasoning, garlic, salt, pepper and oil. Cut three lines thorough the dough and open them up. Cover the pan loosely with a clingwrap and let it rise for 30 minute. Bake at 375 deg.F for 35 minutes. I am a HUGE fan of anything-garlic so I loved this bread.The bread had a beautiful crust and tasted fabulous. Jobin ate a good share and he really liked it too, especially the beef. He actually had a small portion of rice along with it. We went out for a drive after our dinner that day and both of us were kind of sleepy...maybe I added a bit too much wine in the meat :) So if you think 1 cup is too much for 1lb of meat, please modify the recipe to suit your taste. My Double Garlic Fougasse is Yeastspotted! Congrats Ria! Great recipe. Will try it out. Congrats! That is so great. What a lovely stew and a fabulous fougasse! France is at your table. Congrats on the milestone Ria!! Great dish to celebrate!! isnt cooking with wine awesome? next time, try adding some thyme along with the beef when you pressure cook and it brings out a brilliant taste. Wonderful celebration the bread looks gorgeous.. I have bookmarked it Ria.. surely will give it a try..I am sure it would tastes awesome.. by the way all the clicks are very good. Congrats on your achievement Ria! Love the Beef dish... excellent color! First of all let me congratulate you on this fine achievement.100,000 hits in 7 months isn't a joke.You have been posting real good recipes and from someone who've been following your blog from Day 1,I know how you've grown leaps and bounds from there! !The bread looks oh-so-good..lovely!! Congrats Ria. That's a great achievement. I am not a fan of beef but it sounds really delicious. I love the fougasse. Just gorgeous! Even I'm a huge lover of anything garlic. Clap Clap! Ria! That is indeed a great milestone and what better way than celebrating it with beef and bread... great going! Congratulations Ria....you totally deserve it. Your blog is treasure trove of amazing and unique recipes. By the way, I am not sure if I had commented earlier - I totally love your Chicken Gold Coin Recipe. ONION CHUTNEY...a perfect accompaniment !